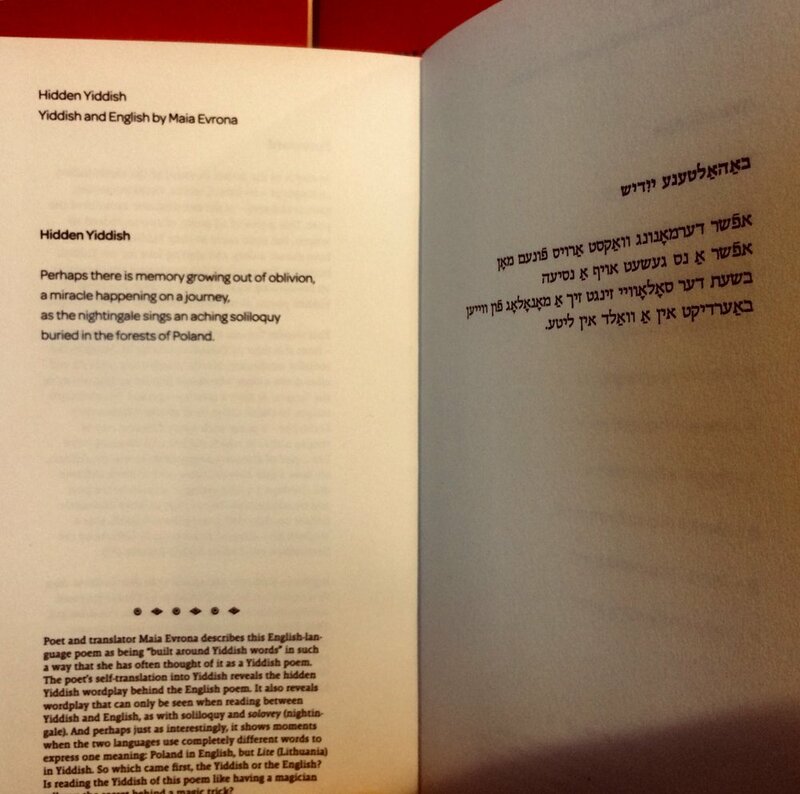 My own original poem, “Hidden Yiddish,” which was first published in the online venue One Sentence Poems was recently included, in both English and my own Yiddish translation, in an anthology of poems about Yiddish published by the Yiddish Book Center. This is a particularly meaningful publication for me. While the influence of “Corona” most likely led to my pondering of the inclusion of the Yiddish word for poppy (mon) within one of the Yiddish words for remember (dermonen zikh), and though that line in “Hidden Yiddish” corresponds to the Germanic root of Yiddish (while the next two lines recall the Hebraic and Slavic roots), the play between the sound of “poppy” and “memory” doesn’t exist in Celan’s German poem. The word he uses for memory is Gedächtnis though mon/mohn is the same (the poem “Corona” contains the line line “we love one another like poppy and memory,” with Mohn und Gedächtnis/Poppy and Memory also serving as the title for the book in which the poem is featured). The word Gedächtnis doesn’t exist in Yiddish (one could say gedekhenish, but I rarely encounter it). While dermonen zikh stems from German, I don’t believe it exists in modern German, though there are similar words that likely come from the same stem. 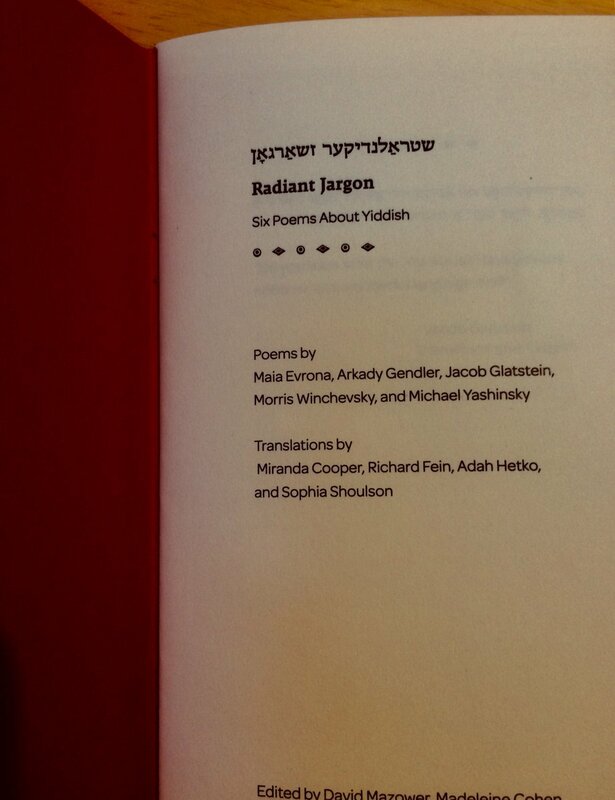 The anthology Radiant Jargon; Six Poems about Yiddish is complimentary for members of the Yiddish Book Center. I’m not sure if it’s possible to buy a copy, but be sure to ask if you would like one. It’s a lovely publication and worth having. It’s not every day that publications include translations of contemporary Yiddish poetry, much less translations of contemporary poetry into Yiddish (my poem is both, in a way). If you would like to know more of my thoughts about Paul Celan, a piece I wrote on him, Nelly Sachs, and their letters to one another, is forthcoming online in Poetry Northwest.